Unboxing a new Samsung phone has become a bit of a religious experience in our house – – – and so it was when we received our Galaxy S9+. There it was. Just sitting there in its black box (which is identical to the black box that housed our Galaxy S8+). We slipped out the case. Opened it. An there it was staring back at us – – – a NEW phone that looked exactly like our old one! 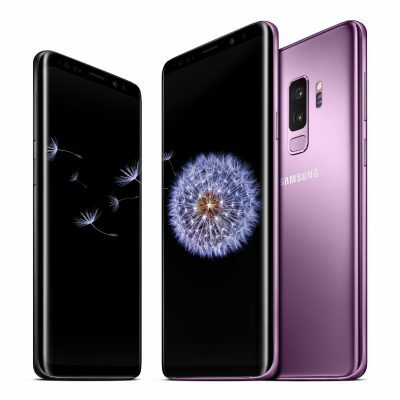 Although it looked the same as our old phone – – – same curved screen, same annoying Bixby button, even the same Edge apps and interface – – – we soon discovered tons of features that made our S8+ obsolete. The first thing we noticed was the relocation of the fingerprint scanner from next to the camera lens to below the S9+’s two lenses. Sitting next to them, instead, was a heartbeat/blood pressure sensor that is designed to work with Samsung’s health apps. The next thing we spotted were speakers at the top and bottom of the phone. Dolby Atmos stereo had come to the world of Samsung! The S9+ also boasts 6 gigabytes for RAM with 64 GB of storage. Plus you can pop in a microSD card to add up to 400 more gigabytes. Security has also been improved to a point where you can choose to use a password, pattern or pin number to unlock the phone. You can also use the phone’s facial recognition, iris scanning and fingerprint scanning capabilities to make it even more secure. Since we had backed everything up to our Google and Samsung accounts, setting up the new phone was simple and easy. All we had to do was log into our accounts from the new phone and all of our files, contacts and images were downloaded to the new device. Next, it was time to play with the camera! This is where the new phone really shines and the reason we chose the S9+ over the smaller S9. It took us a while to get used to the dual aperture features, which allowed us to shoot in extremely low light. But, once we figured it out, the results rivaled what we were getting from our Nikon DSLR. Then we tried the slow motion feature, which reduces the video frames rate from 60 fps to up to 240 fps, which is SUPER slow. The phone also gives you the ability to create your own emoji using the front-facing camera. The result was a cartoonish image of ourselves, which resulted in a few complaints from those that are image conscious. Bixby, which – – – even after a year of availability – – – is still a work in progress. We still rely on Google for voice assistance and other artificial intelligence features. There have been a few improvements to Bixby, including Bixby Vision, which can convert currency, translate languages on the fly, etc. But we still found Google to be more responsive. One thing that really surprised us was how long we were able to use the phone without needing to recharge the battery. With so-called “average use” we were able to use the phone for more than two days before it started bugging us for more juice. Now we come to our pet peeve. The folks at Samsung have, again, decided to permanently install the battery after teasing us with a removeable battery in the S8. They had done this once before and the justifiable outcry was loud enough for them to abandon the practice. The headphone jack input is still there, which gives it a huge thumbs up compared with its competition. Being a technonerd I’d say definitely, especially for the longer battery life and cool camera features. But the final decision should be based on what features you really need. Truthfully, if you aren’t addicted to taking pictures and videos with your phone, it may not be worth the extra expense. The cost varies, depending on the carrier you use and there are all sorts of two-for-one and leasing deals available. But this ain’t your mama’s flip phone and can result in a hefty load on your credit card – – – the suggested retail price is $840.